Michael Snow is, without doubt, one of foremost living artist, and a central figure in North American art in the latter half of the Twentieth Century. Since the reception of the “Independent Film Award” (1968) from the journal Film Culture, his work was placing in the ranks of such major figures of avant-garde cinema as Stan Brakhage and Gregory Markopoulos as well as in the company of two other artists-turned-filmmakers: the photographer Robert Frank and the painter Andy Warhol. The image of Michael Snow that emerges from this complete mongraph is of a contemporary Renaissance man. The artist himself captured this diversity in a profile written in the late 1960s “I am not a professional. My paintings are done by a filmmaker, sculpture by a musician, films by a painter, music by a filmmaker, paintings by a sculptor, sculpture by a filmmaker, films by a musician, music by a sculptor… sometimes they all work together […]". 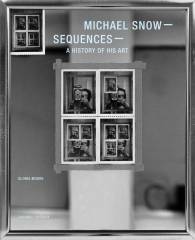 Mixing reflexive humor with a nuanced grasp of the many faces of contemporary art, Snow’s text acknowledges the difficulties an artist faces in approaching different disciplines when there is ‘a tendency towards purity in all these media as separate endeavours’. Within a structure of seventeen chapters, the artist makes a complete overview on his own work, writing the texts, doing the sequences…an editorial task he knows very well, as we can understand seeing his remarkable artist books. Certainly, this is an unsurpassed book about one of our most outstanding artists. >> Gloria Moure is a renowned freelance curator and editor. On last ten years, she has curated exhibitions and edited referente monographs on key contemporary artists, such us Sigmar Polke, Gordon Matta-Clark, Dan Graham and Marcel Broodthaers. >> Bruce Jenkins is professor of film, video, new media, and animation at the School of the Art Institute of Chicago. Former curator of film/video at the Walker Art Center (Minneapolis), he currently works in the catalogue raisonné for the films of Andy Warhol.